Four Green Fields was written by Tommy Makem in 1967. He was an Irish folk musician well-known for his associations with The Clancy Brothers as well as Liam Clancy of Makem and Clancy fame. 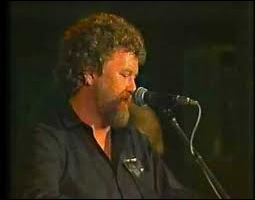 This version of the song is by Jim McCann from the album By Request. | 1 2 3 | or |1& 2& 3& | or in this case where you are playing a hammer-on hammer-off on the the 3rd beat of the bar | 1& 2& 3&& | etc. Tempo: approximately 100 - 102 BPM. The Intro | G |... x6 can be played as | G / G-h |... x 6 where you hammer on and off on the 3rd beat of each bar. In this example you will count the bar as 1& 2& 3&& - the && is played in the same time as &. This means that you play G for 2 beat counts and the 3rd beat count is split in 3 so that the hammer-on-off actually occurs on the && of 3&&, with the 3 being an open G chord played with fingers 2,3 and 4 while finger 1 plays the hammer-on (C note) & hammer-off (C note). Play it slowly counting the beats as you go... you will hear this if you are playing with the video. You don't have to play the hammer on. It provides a bit of interest and it teaches you a little more about guitar technique. If you are not playing with the video, you don't have to play the 4 bars of G at the end of verses 1 & 2 - you may prefer 2 bars. I have added a Dsus2 which is included in the video. Again you can just continue with a D chord or you can spice it up a bit using a Dsus4. Whichever chord you decide on, it will still sound fine. "Four Green Fields" chords and lyrics are provided for educational purposes and personal use only.